Off road hardtail frame built in T6 high grade aluminum finished in Matt Black with Rockshox Recon Silver suspension fork with 100mm of travel. 650B wheels set shod with Schwalbe Nobby Nic 2.35 off road tyres. 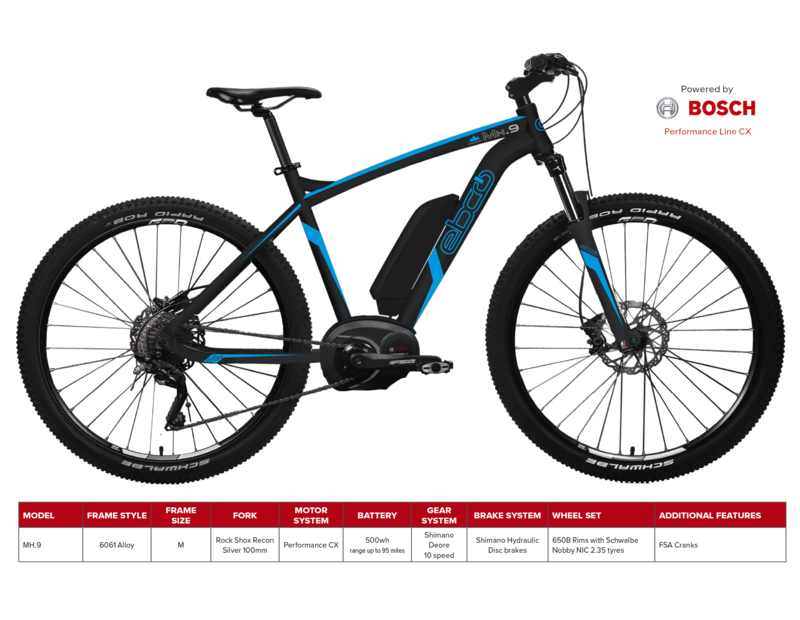 Bosch Performance CX Centre Drive motor with 4 power assist modes and incorporating the Intuvia handlebar mounted informative information Centre. Lithium-ion 36V 500WH Bosch frame fitting battery which locks securely and is removable for charging (charger supplied). Range: Up to 95 miles (Range depends on many factors including, levels of assistance, riding conditions, temperature, tyre pressure, and riders weight. Shimano Deore 10 Speed Rear Derailleur Gears teamed with Shimano`s performance enhancing rapidfire shifters. Shimano M355 Hydraulic Disc brakes, the ultimate efficient braking system. Adjustable handlebar stem, comfort bars and grips, Selle Royal Saddle allowing fine tuning of your riding position. All EBCO electric bikes Comply with the latest EN15194 EU Standard. Display: TranzX DP-16, 3 power support modes, turbo feature, speed indicator, remaining battery indicator, light function and walk assist feature. Pedals: VP resin comfort pedals, 9/16\\\\\\\\\\\\\\\\\\\\\\\\\\\\\\\\\\\\\\\\\\\\\\\\\\\\\\\\\\\\\\\\\\\\\\\\\\\\\\\\\\\\\\\\\\\\\\\\\\\\\\\\\\\\\\\\\\\\\\\\\\\\\\\\\\\\\\\\\\\\\\\\\\\\\\\\\\\\\\\\\\\\\\\\\\\\\\\\\\\\\\\\\\\\\\\\\\\\\\\\\\\\\\\\\\\\\\\\\\\\\\\\\\\\\\\\\\\\\\\\\\\\\\\\\\\\\\\\\\\\\\\\\\\\\\\\\\\\\\\\\\\\\\\\\\\\\\\\\\\\\\\\\\\\\\\\\\\\\\\\\\\\\\\\\\\\\\\\\\\\\\\\\\\\\\\\\\\\\\\\\\\\\\\\\\\\\\\\\\\\\\\\\\\\\\\\\\\\\\\\\\\\\\\\\\\\\\\\\\\\\\\\\\\\\\\\\\\\\\\\\\\\\\\\\\\\\\\\\\\\\\\\\\\\\\\\\\\\\\\\\\\\\\\\\\\\\\\\\\\\\\\\\\\\\\\"
Weight of bike Inc. battery: 25kg approx.